A perennial bestseller from a leading authority, this book provides an effective 10-step program for training parents in child behavior management skills (ages 2 to 12). Professionals get proven tools to help parents understand the causes of noncompliant, defiant, oppositional, or socially hostile behavior at home or in school; take systematic steps to reduce it; and reinforce positive change. Comprehensive assessment guidelines are included. In a large-size format for easy photocopying, the volume features numerous reproducible parent handouts and two rating scales (Home Situations Questionnaire and School Situations Questionnaire). New to this edition: reflects 15 years of research advances and the author's ongoing clinical experience fully updated model of the nature and causes of oppositional defiant disorder (ODD) revised assessment tools and recommendations the latest data on the program's effectiveness. Russell A. Barkley, PhD, ABPP, ABCN, is Clinical Professor of Psychiatry and Pediatrics at the Medical University of South Carolina. 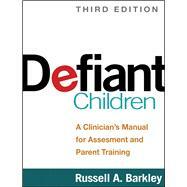 Dr. Barkley has published numerous books and five assessment scales, plus more than 275 scientific articles and book chapters on ADHD, executive functioning, and childhood defiance. He is also the editor of the newsletter The ADHD Report. A frequent conference presenter and speaker who is widely cited in the national media, he is past president of the Section on Clinical Child Psychology (the former Division 12) of the American Psychological Association, and of the International Society for Research in Child and Adolescent Psychopathology. His website is www.russellbarkley.org.